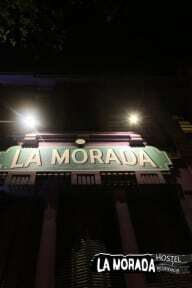 La Morada Hostel offers a spacious, comfortable and safe place to enjoy a happy stay. The hostel has 14 large rooms of 2, 4, 6 and 8 beds each. The residential area is in a separate place within the same hostel. There are 12 bathrooms in each area. There is a large central patio to share a mate, some coffee or just relax. There are common areas for recreation such as the outdoor terrace which has grills and a solarium. There is also a bar with a game room. We offer free WiFi and cable TV. Last but not least, there are 16 security cameras in the hostel. La Morada hostel is in the best location because it combines the tranquility and safety of the neighbourhood (Palermo Viejo) with the proximity to the daytime as well as nighttime centres known as Palermo Soho and Palermo Hollywood. It is located nearby important avenues such as Santa Fe, Scalabrini Ortiz and Las Heras. It is close to Plaza Italia and Subway D which can take you in 10 minutes to very important Faculties: The Faculty of Medicine and The Faculty of Economics from the UBA (Buenos Aires University). We are at 10 minutes´ walk to the UP (Palermo University) and the UTN (National Technological University). And just a block away from the hostel there is Guadalupe square next to Guadalupe Virgin traditional Church. There are single beds in some rooms and bunk beds in others. Linen is included. There are desks with table lamps, wardrobes as well as ceiling fans and heating in the rooms. There are also security lockers. You may call the reception from the rooms. Terrível. Reservei esse hostel pela facilidade de pagar com cartão de crédito, como está em sua descrição, e é confirmado na hora de fazer a reserva no site. Quando cheguei lá, me informaram que não aceitavam nenhum tipo de cartão, não pediram desculpas e falaram que não poderiam fazer nada. Não fiquei lá por esse motivo e ainda perdi o dinheiro da reserva. Além disso, no site dizem que tem café da manhã incluído, e na hora não tem nada.